Sculpting the moon’s surface, Griffith Observatory, 1939. As I was sifting through images of the moon this morning, I found this photo taken at Griffith Observatory in 1939. 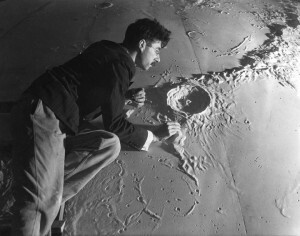 Shown is Roger Hayward, the artist commissioned in 1934 to create a model of a section of the moon for the observatory. Hayward was trained as an architect, earning his degree from MIT before relocating to Pasadena to pursue a career as a designer. He served as chief designer for the Los Angeles Stock Exchange (1929), designed by his MIT classmate, Sam Lunden, and also contributed to Lunden’s design for the Doheny Library at USC (1930). If you recognize his name, however, I doubt it’s because you’ve been studying his architectural designs. It’s more likely you remember the illustrations he did for the “Amateur Scientist” column in Scientific American magazine between 1949 and 1974, or even more likely, the drawings he did to illustrate Linus Pauling’s research. How does one make the leap from architect to illustrator of science? In Hayward’s case, it involved a brief stop at the moon. Moving to Pasadena worked out well for him, even though the Great Depression shut down his career as an architect almost as soon as it had begun. When the Stock Market crash put an end to large-scale design projects in southern California, Hayward kept himself busy with painting, puppetry, and physics. Pasadena sits just below Mount Wilson, so when Hayward’s interests expanded to include astronomy and mathematics, he was able to take advantage of the Caltech minds at work at the Mount Wilson Observatory. Various Caltech associates tutored him in atomic theory and he built a few smaller instruments—a 6-inch reflector telescope, a quartz spectograph—by way of educating himself in the field. Hayward was given access to the 100-inch telescope on Mount Wilson so he could supplement the observatory’s photographs with first-hand observation of the moon. His design (and Gruenfeld’s sculpting work, Gruenfeld is always left out of the story) was apparently well-received, as the observatory commissioned him to design and build models of Oregon’s Crater Lake and Arizona’s Meteor Crater as soon as he finished the moon section. Adler Planetarium was eager to get in on the action and hired Hayward to design a scale moon model with a 6-foot diameter. Walt Disney eventually saw the financial potential in the projects and commissioned Hayward to duplicate his moons for the “Man in Space” television show and Tomorrowland exhibits. Although he worked in other fields after finishing the models (he designed a commercial nutcracker, for god’s sake), Hayward continued to advance his studies in astronomy and physics. He partnered with a Caltech associate to design a movie projection screen and write a physics textbook. He must have thought he’d died and gone to heaven when he was offered a position as an optical engineer at Mount Wilson Observatory in 1941. Much top secret stuff in support of the war effort ensued. After the conclusion of the war, Hayward partnered with Sam Lunden once again, forming the firm of Lunden, Hayward & O’Connor. For architectural historians, Hayward’s story tends to end here: the firm designed the Los Angeles City Health Building, the Mira Costa High School, a VA hospital in Arizona, the Temple Israel of Hollywood, and several other mid- to high-profile projects in the LA basin. However, although the partnership looked successful from the outside, from the inside, it was obvious that it was flawed almost as soon as the papers were signed by the trio. Hayward and O’Connor in particular didn’t get along and the partnership was dissolved in 1957. The tension between Hayward and O’Connor probably had something to do with the fact that Hayward’s attention was always directed elsewhere. Specifically, he was more concerned with his delineating work for Scientific American than he was with the success of Lunden, Hayward & O’Connor. He had completed his first job for the magazine in 1948, illustrating George Beadle’s “The Genes of Men and Molds”. The quality of Hayward’s drawings pleased the magazine, the paycheck pleased Hayward. Although he worked on many projects throughout the rest of his career—collaborating with Linus Pauling, for instance—Hayward continued to draw for Scientific American until his health and vision failed him. The burning question of the day: what happened to the lunar section Hayward and Gruenfeld built at Griffith Observatory? Many (mistaken) bloggers attribute the moon currently on display at the observatory to the hand of Hayward, but that’s a much more recently produced object and at any rate, not a section model, but a smallish moon (there’s no way Hayward could perch on top of it and sculpt the Mare Imbrium region). According to a comment that appears to have been written by someone associated with Griffith Observatory, the Crater Lake and Meteor Crater models are in storage. But where’s the lunar section? Contacting the observatory is on my list of things to do, but in two days, I’m moving halfway across the country, so that list is going to have to wait awhile. If you know, drop me an e-mail and I’ll update this with the information. ETA: Here’s a link to a few construction photos of Griffith Observatory and Planetarium. You’re welcome. Most of the information included here about Roger Hayward comes from on material held in the Special Collections & Archives Research Center, Oregon State University Libraries. See Roger Hayward: Renaissance Man for a glimpse into the archive. “An Observatory for the Public,” The Literary Digest (April 20, 1935): 28. Ben H. O’Connor, “Letter from Ben H. O’Connor to Samuel E. Lunden and Roger Hayward, 1957,” in Special Collections, Item #2356, (accessed August 29, 2012).